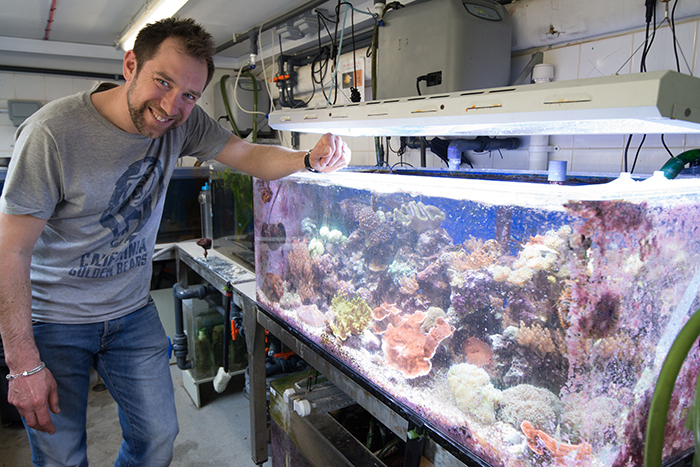 By Richard Aspinall My visit to the Horniman museum was sparked by my interest in Project Coral – a pioneering project undertaken by the team at the Horniman Aquarium, to purposefully reproduce broadcast coral in captivity. 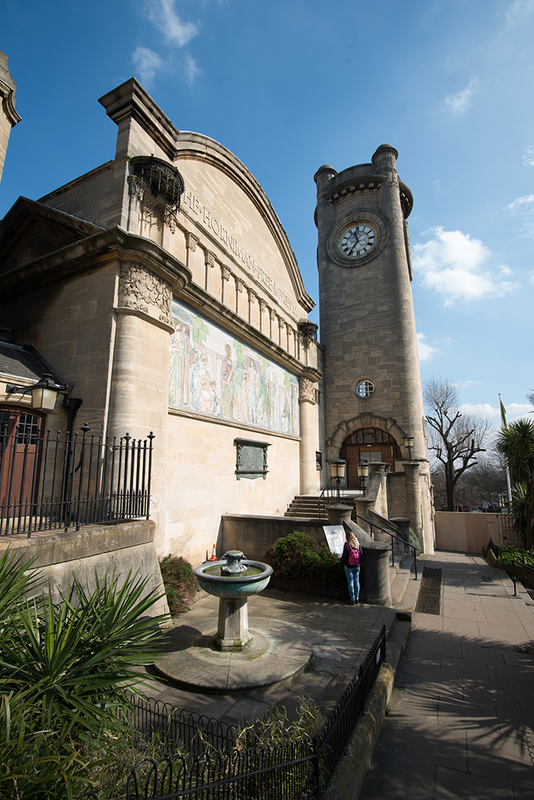 But in order to understand how this work came about, it’s interesting to first look at the history of the Horniman and have a look at its exhibits. Jamie in the quarantine area. Photo by Richard Aspinall. It’s a remarkable building. Photo by Richard Aspinall. 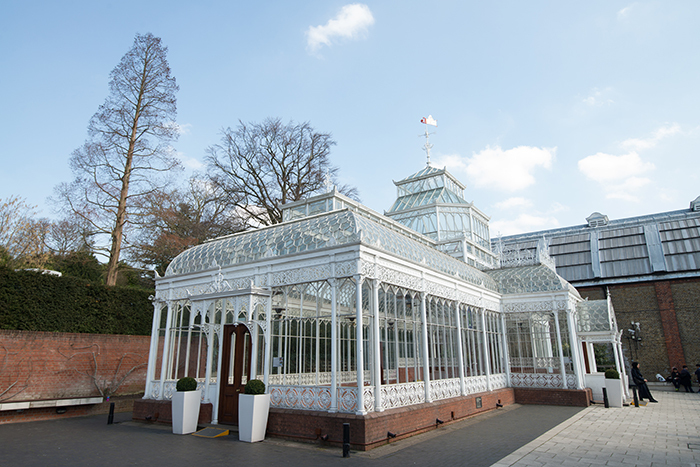 A recently renovated glass house in the grounds. Photo by Richard Aspinall. You can see Central London in the distance. Photo by Richard Aspinall. The Horniman Back in simpler, and less ethical times, rich business folk would gather trinkets, curios, specimens, statues and the like and have them shipped home from the far-flung edges of the British Empire. As they passed away or their collections became too large, countless objects would be gifted to the nation. Such was the story of Frederick John Horniman who was able, through the family tea business, to collect objects that ‘either appealed to his own fancy or that seemed to him likely to interest and inform those who had not had the opportunity to visit distant lands’. 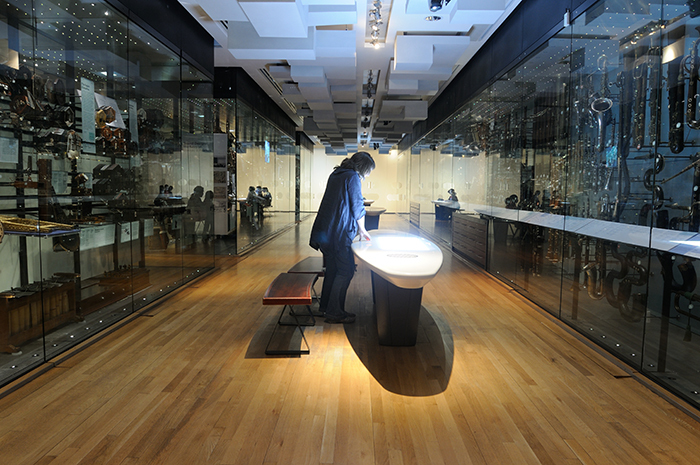 Some of the display cabinets might be considered ‘old school’, but they are matched by cutting-edge galleries elsewhere in the museum, like this interactive display involving the collection of musical instruments. Photo by Richard Aspinall. The resulting museum, a short train journey from Central London, is fascinating. When I visited, it was absolutely thronged with children and their parents enjoying the early spring sunshine. 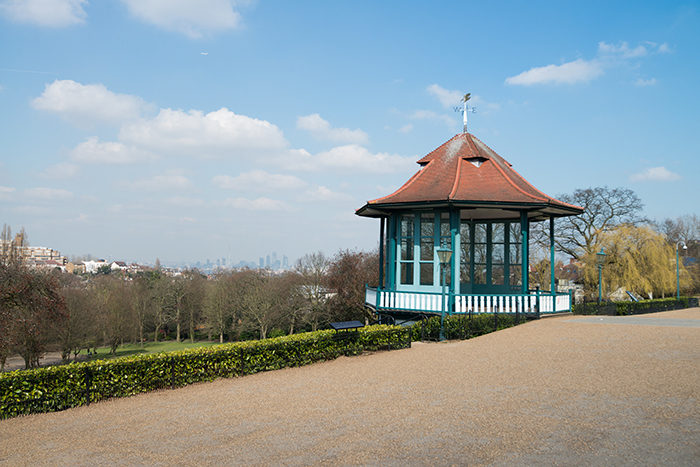 The wonderful views of Central London in the distance contrast with the acres of gardens that offer a wonderful break from the city’s hustle and bustle. What you might not necessarily realise from the building’s interesting architecture is that it plays host to one of the most unique aquariums in the land and one of the oldest. 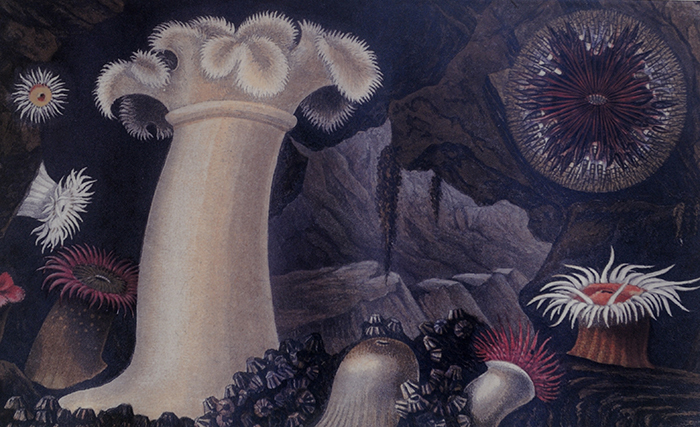 Gosse and his Anemones Philip Henry Gosse (1810 -1888) is arguably the ‘father’ of the marine aquarium and, in the 1850s, he began experimenting with ways to keep marine creatures alive ‘without diving to gaze on them’. In 1854, his book, The Aquarium sparked a Victorian craze for the hobby as he described what he termed ‘glimpses of the wonderful’. 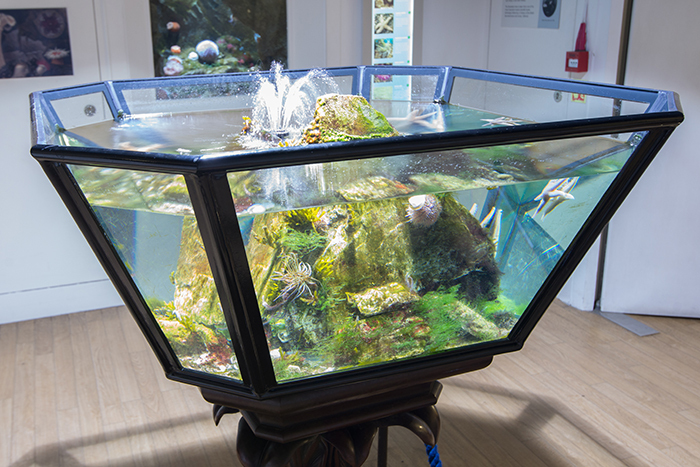 Because of links between Gosse and Horniman, the museum has recreated one of Gosse’s aquaria as part of a major refurbishment of the aquarium. 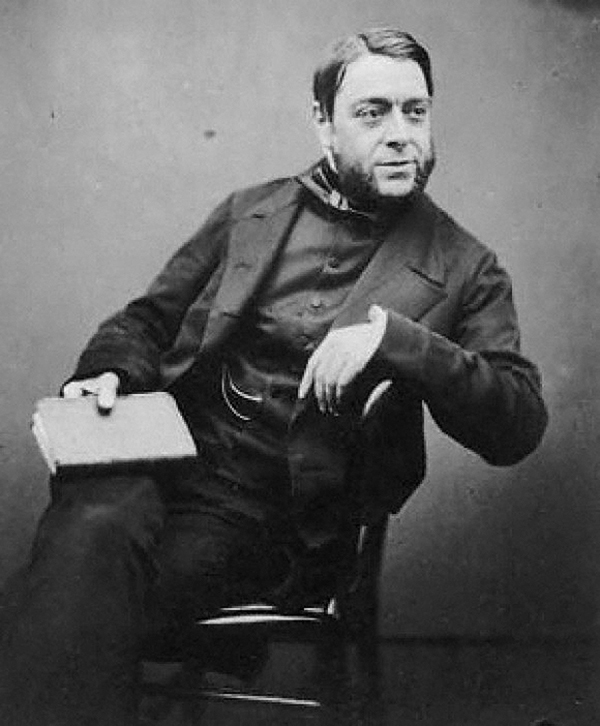 Gosse, a chum of Charles Darwin, (who was himself an expert on corals and barnacles), was fascinated by British marine life and wrote the first authoritative book on the subject: British Sea Anemones and Corals in 1860. A recreation of one of Gosse’s aquariums, populated with UK native species. Photo by Richard Aspinall. Not only has the Horniman reproduced one of Gosse’s tanks, they have also recreated an anemone tank to match one of the plates from Gosse’s book. This would have been easier if the anemones would stay put but, as they have a tendency to wander, it’s an admirable achievement. …And a recreation. 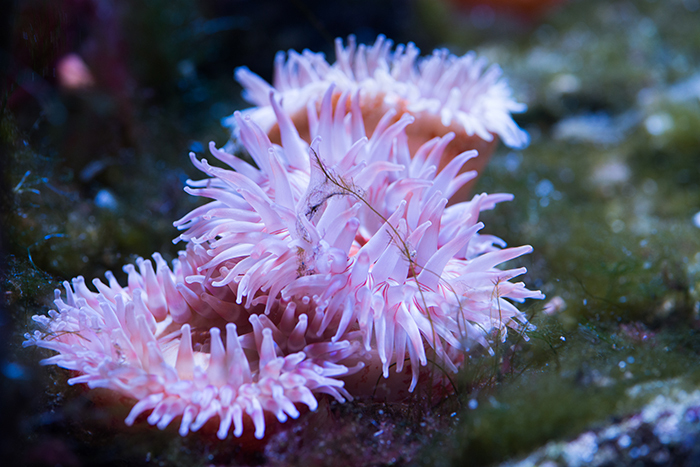 This would work better if the anemones would stay still. Photo by Richard Aspinall. A Dahlia Anemone. Photo by Richard Aspinall. Behind the Scenes The Horniman’s commitment to conservation messages and showcasing the less ‘showy’ species which commercial aquaria tend to ignore, is to be commended. I’m enormously impressed by the team’s commitment to research and sustainability and, I was lucky enough to be allowed behind the scenes to see many of the fish and livestock that have been produced via captive breeding programs. 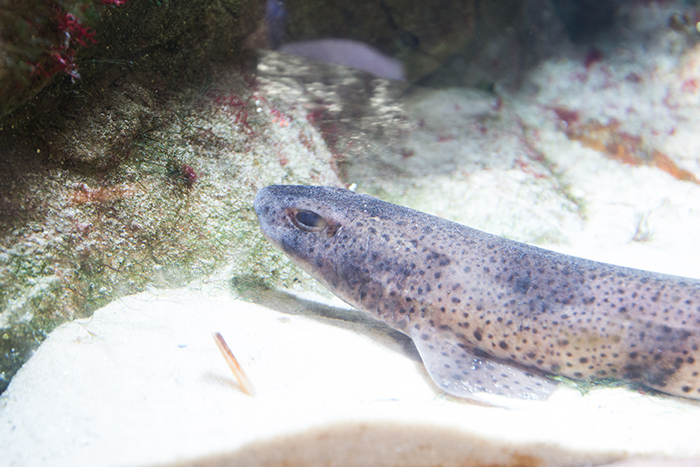 The team shares these with other sites such as the aquarium at the Zoological Society of London. 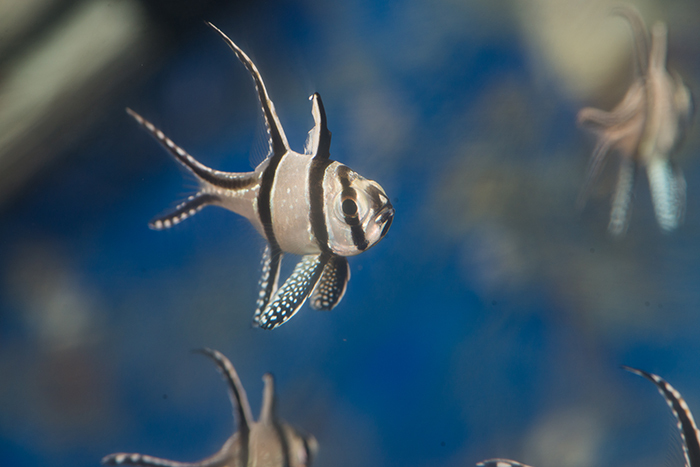 Banggai’s raised at the ZSL aquarium, in QT. Photo by Richard Aspinall. Jamie with a tank of various corals for use in the exhibits. Photo by Richard Aspinall. 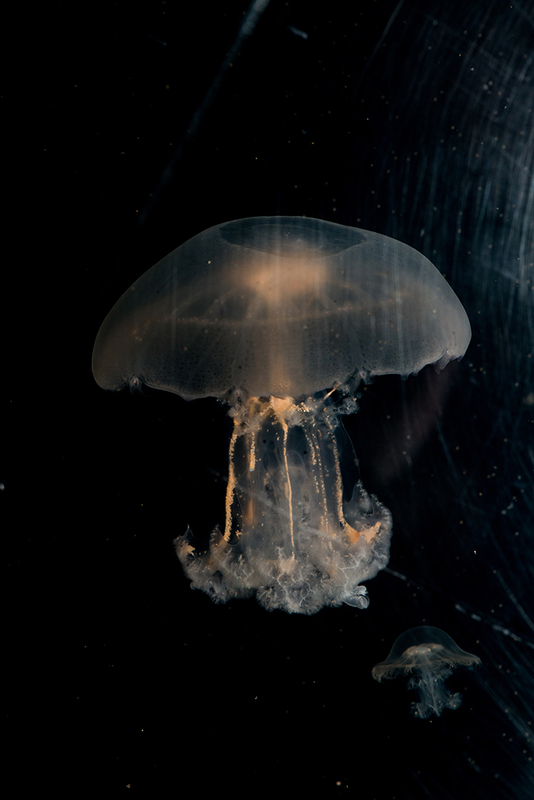 Jellies are raised on site. Photo by Richard Aspinall. Rhizostoma pulmo, the first time this species has been cultivated in the UK. Photo by Richard Aspinall. I’d not been to the Horniman for a few years and I was looking forward to seeing how the aquarium was looking. I managed to grab a few hours of Jamie’s time and as we chatted and enjoyed a cup of coffee in his shared and cramped office (UK public aquaria ask a lot of their staff and can’t always offer them a lot of space) He told me about Project Coral and how a few journalists covering the project haven’t necessarily helped. One, writing for a national newspaper, implied the project would save the world’s coral reefs, missing the point a little. I promised to be a little more guarded. I was particularly keen to see one of the exhibits that had been recently renovated; the Amazonian system, which to be more accurate, is a ‘species-specific recreation of a river bank from the Brazilian Amazon’. 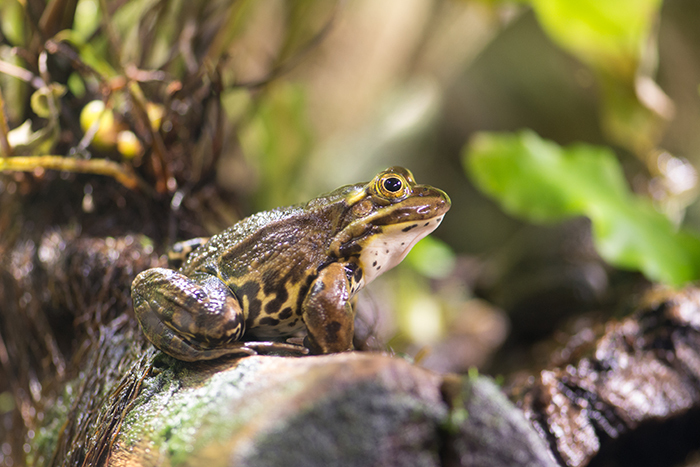 The Horniman team has put a great deal of effort into recreating biotope exhibits that are as accurate as possible in terms of aquatic and terrestrial species. The Amazonian system holds Discus, Rams and small tetras and amidst the vegetation, Heliconius butterflies flit from leaf to leaf. 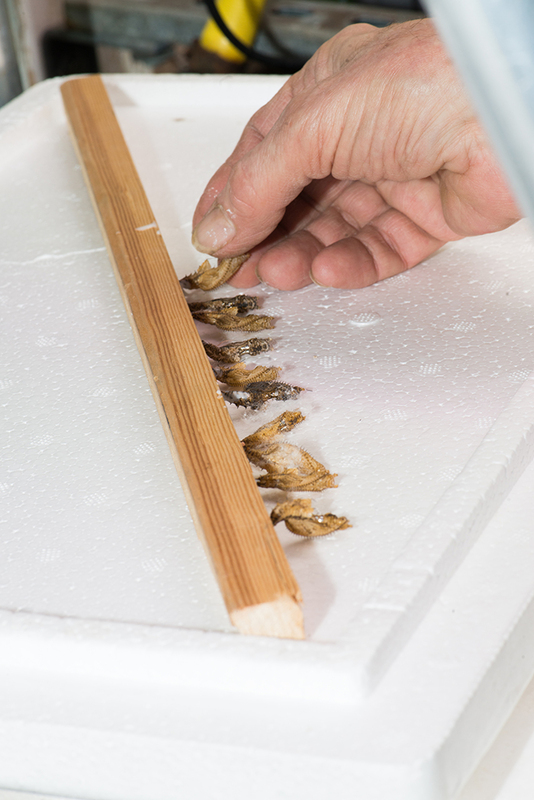 Behind the scenes, one of Jamie’s colleagues is attaching ready-to-hatch butterfly pupae to wooden strips ready to be hung in the exhibit. 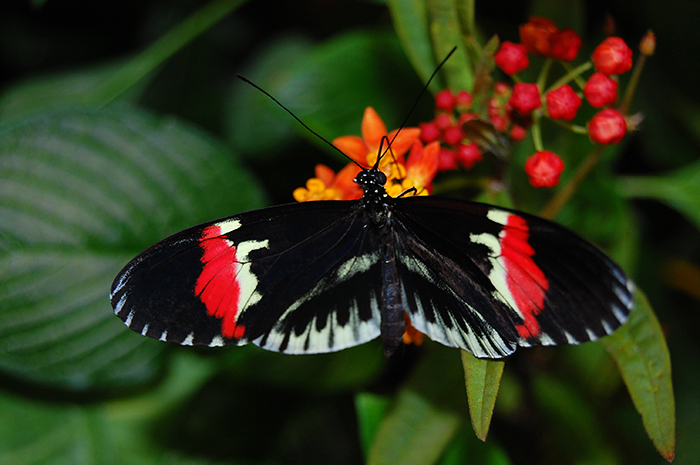 Heliconius butterfly. Photo by Jamie Craggs. Butterflies are introduced as pupae. They are attached to wooden batons and hung in the exhibit to emerge over the course of a few days. Photo by Richard Aspinall. One of my other favourite systems in the aquarium is the British Pond. Again it’s a biotope exhibit and reminds me of places I visited – and sometimes fell into – in my childhood. 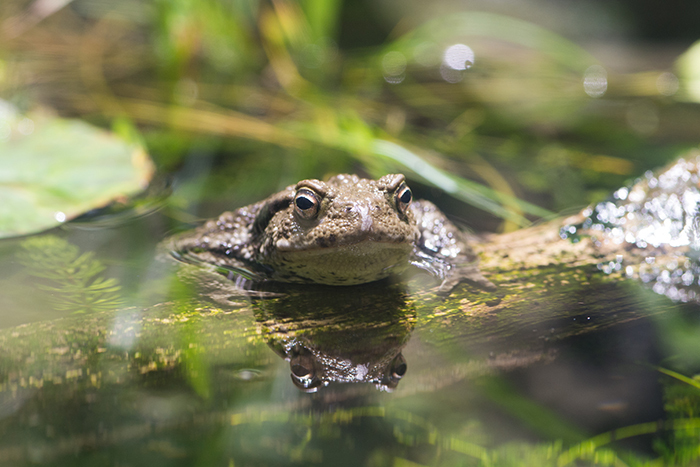 This exhibit holds European Common Toads and the rare Pool Frog, which has recently been re-evaluated and is now considered a British native. The animals are removed on a seasonal rotation to allow them to hibernate, thus replicating their natural life cycle. Common toad. Photo by Richard Aspinall. Pool frog. Photo by Richard Aspinall. As we wandered from exhibit to exhibit I asked Jamie about the Fijian reef system that I had seen on my last visit. it had had a few issues, which Jamie traced back to heavy metal contamination in the tank’s construction materials. After a major refit Jamie had taken the reef to a very high standard but it would appear that the tank has a yet another source of contamination. This time the heavy metals are leaching from the rubberised coating used to seal the tank’s rear walls. Massive water changes have been able to sustain the system, but the only sustainable solution will be to strip it down. A new display will be created using species from the Great Barrier Reef tank. Today, the tank still looks better than many, but the one that will follow will look even better, I’m sure. 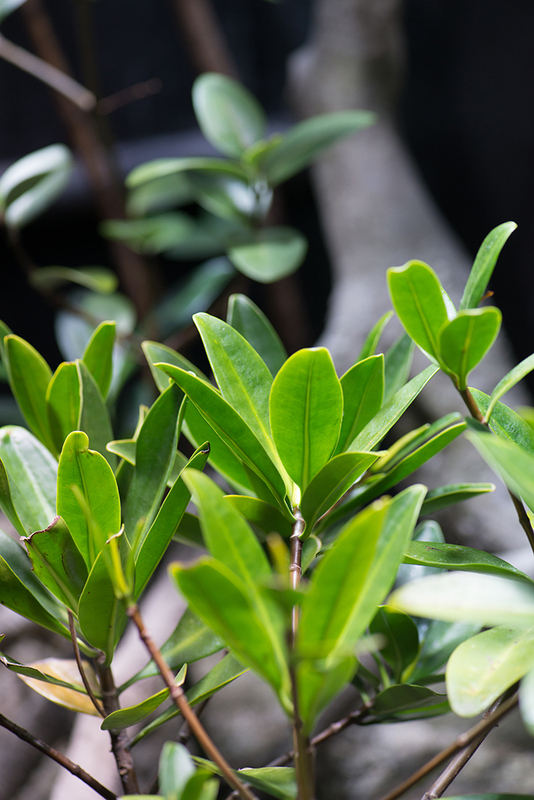 Jamie will also be upgrading the Mangrove tank and changing it to an Indonesian Biotope which will focus on the complex mangrove root systems and the threats mangroves face from habitat-loss. 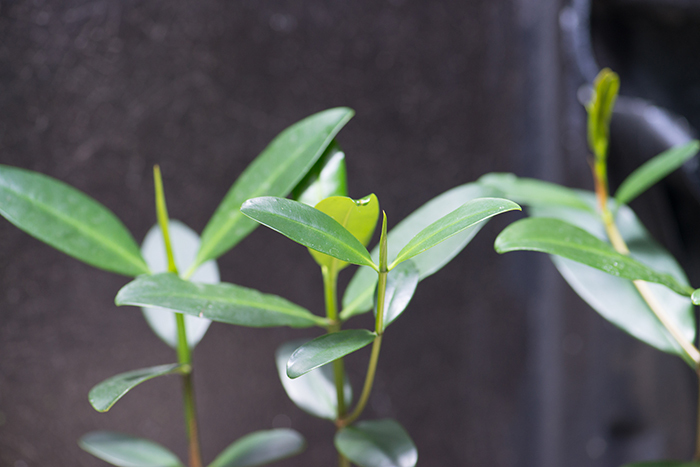 At present, the exhibit carries Rhizophora mangle and Avicennia germinans species with a bed of Caulerpa. It looks pretty fantastic to me. The new system will feature lots of Montipora species growing on and amidst the roots. R. mangle. Photo by Richard Aspinall. A. germinans. Jamie keeps pinching out the growth tips to encourage the plants to ‘bush out.’ Photo by Richard Aspinall. Ten-spined Stickleback Pungitius pungitius. Photo by Richard Aspinall. 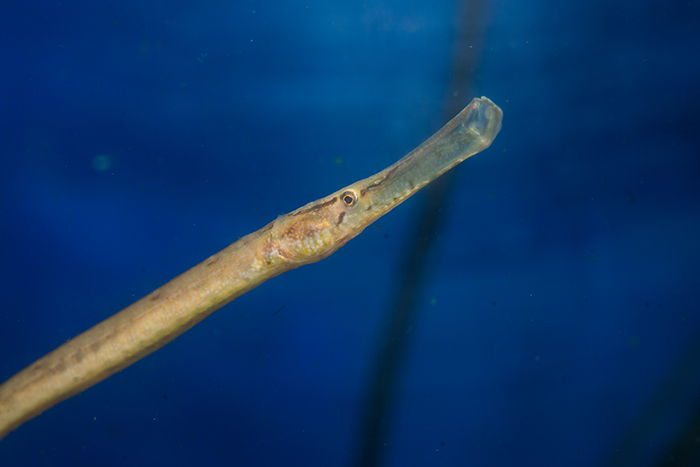 Deep snouted pipefish (Syngnathus typhle) in quarantine ready to be released into the British Seashore exhibit. Photo by Richard Aspinall. 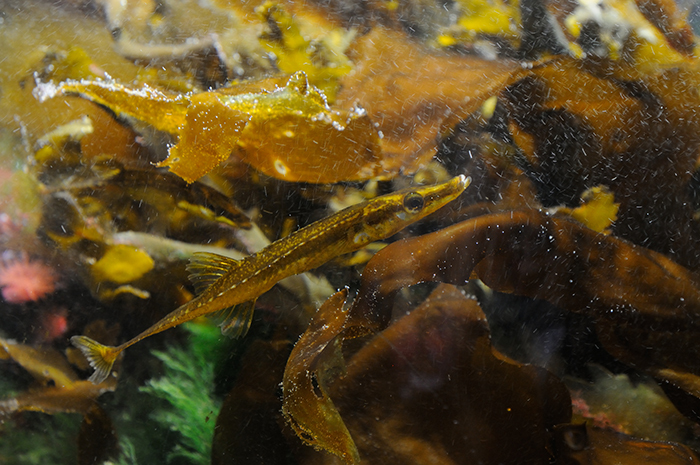 A Lesser Spotted Dogfish (Scyliorhinius canicula) rests up behind thick acrylic making the image a little blurry. Photo by Richard Aspinall. 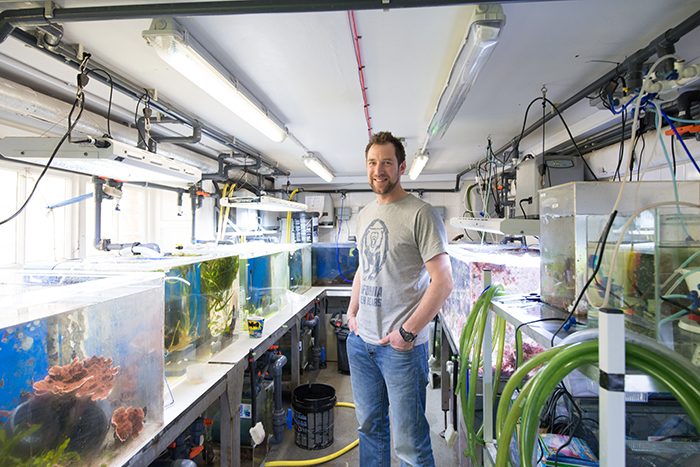 Jamie Craggs has worked at the Horniman for eight years and along with three other aquarists, he looks after the exhibits. He is rightly proud of Project Coral; I suspect it has taken over his life a little, but you can tell he’s very proud and hopeful that his work and that of his collaborators at SECORE International will contribute to further research, restoration projects and maybe even to help create new coral strains of interest to mariculture operations. Like many great science projects, the eventual benefits of the initial work are not yet known. 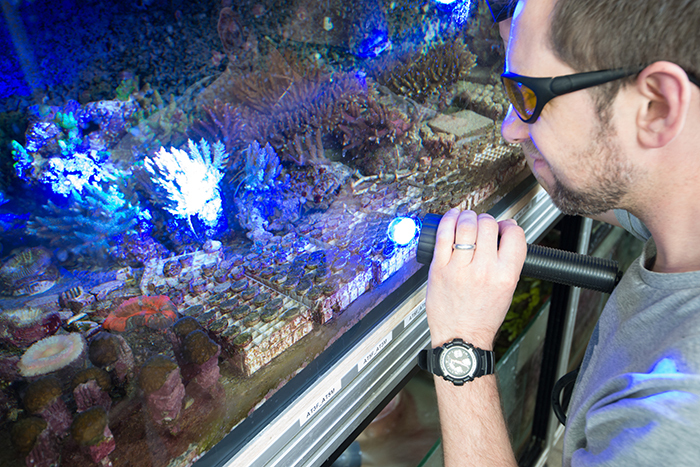 Jamie uses UV light to check on the coral larvae, see here on small plugs at the front of the aquarium. Eight crosses were made. Incidentally, there’s a few colonies in this tank that are descended from the famous Stuber Acropora! Photo by Richard Aspinall. The project started in 2012 with the simple goal of purposefully inducing Acropora colonies that had been in the collection for 10-15 years, to broadcast spawn.. 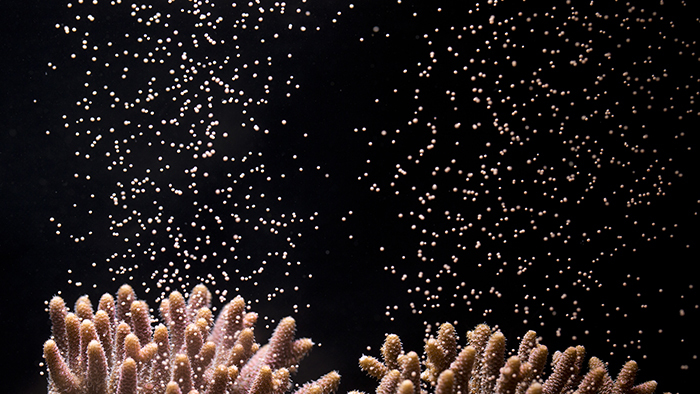 The team replicated the coral’s native water conditions (matching seasonal factors), and in 2013 were rewarded by the release of nearly 300,000 eggs, during two spawning events. Now it’s easy to miss the point here: Corals have spawned in captivity before, but what is of importance is the fact that the team had created the conditions that allowed them to determine when the gamete release would take place, as the museum’s website states: “the Horniman Aquarium became the first institution globally to purposefully reproduce broadcast coral in captivity.” This initial success laid the foundations for Project Coral, which is currently focusing on two areas of the world, Singapore and Australia’s Great Barrier Reef. 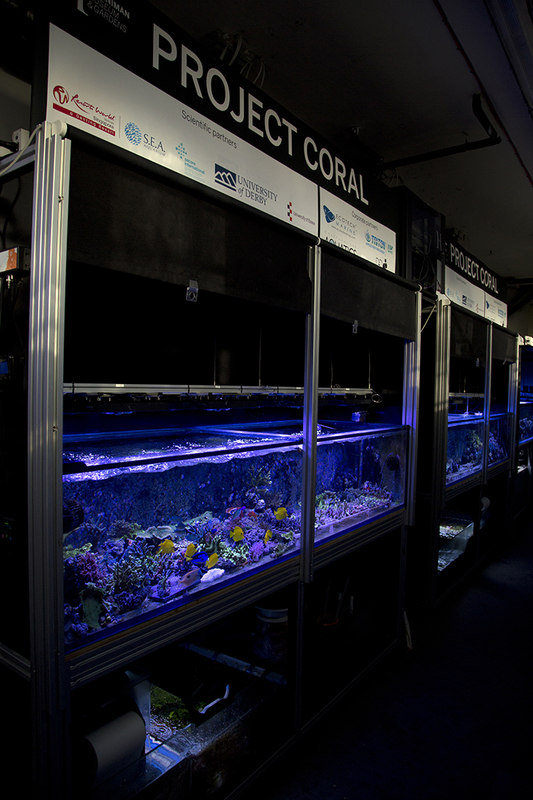 In 2014, after discussions on a beach in Guam during SECORE International coral spawning workshop, the Horniman teamed up with SECORE International and S.E.A. Aquarium at Resorts World Sentosa in Singapore and formed Project Coral Singapore. Working with Acropora hyacinthus, frags from a Southern Singaporean reef were send to London, with goal on maintaining spawning synchrony between captive and wild corals and gain a deeper understand of what triggers spawning events. Newly settled coral polyps. Photo by Jamie Craggs. Jamie is the first to admit that this work was done in a typical reef keeping way, in a system that any hobbyists would recognize, nothing high tech. He became aware that the project would need to move away from the Berlin system if they were to have even closer control of water parameters and nutrient levels and, as a result, he has moved the Project’s tanks over to the Triton system. He is very grateful to Triton Labs for their support and also to EcoTech who have supported the project as well. He now uses Radion units and can tailor spectra and output to closely match published data from NASA and the Australian Institute of Marine Sciences. A. millepora. Photo by Jamie Craggs. 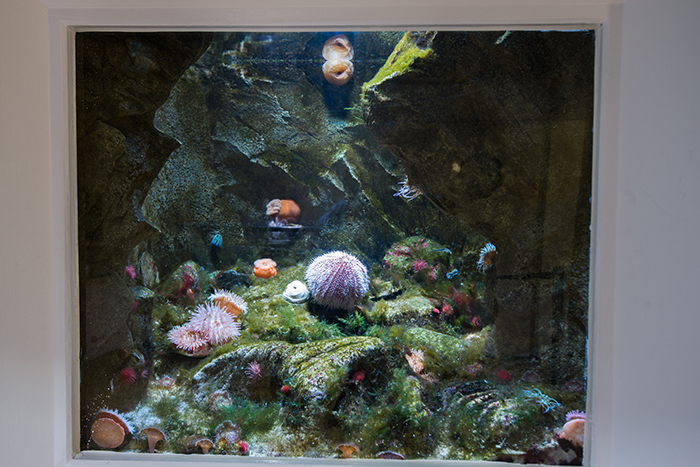 As an aside, Jamie and his team were asked to set up a coral tank as part of an exhibit in London’s Natural History Museum. The tank, placed near the Museum’s iconic Diplodocus in the main hall, was a fair distance away from a source of water so large water changes were out of the question and the Triton methodology came into its own. 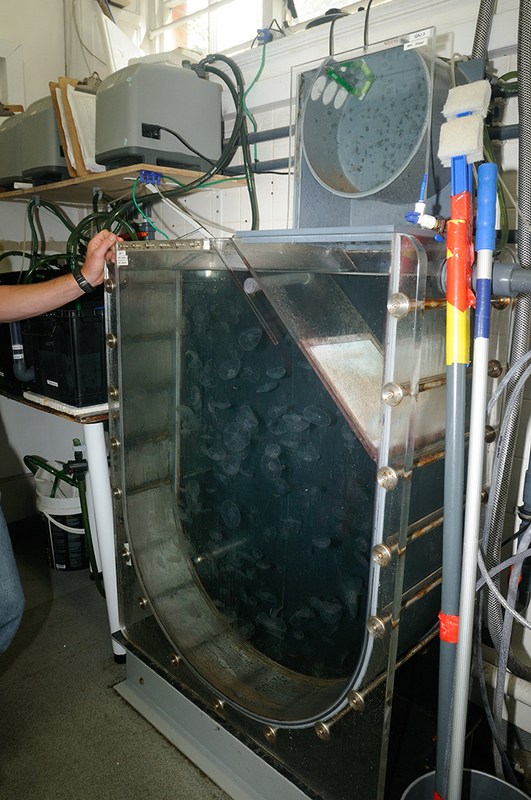 Interestingly, the water testing available from Triton has allowed the team to identify contaminants and heavy metals in a range of materials, from plastic tubs used in the jelly rearing tanks to the metals leaching from the lining of the reef tank. Jamie told me he’d spoken to someone at ZSL many years ago, who had identified lead poisoning in their parrots, which had been eating their plastic food tubs. It seems heavy metals can be found in the most unlikely of products. 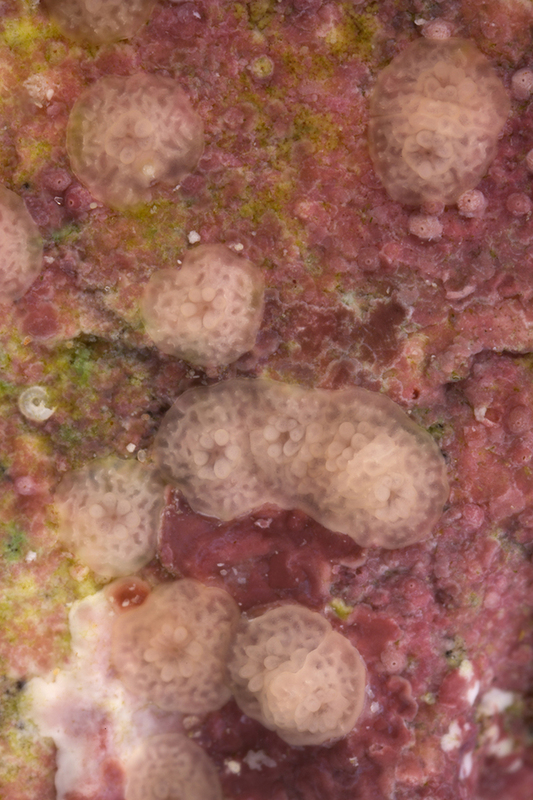 The project’s latest success has been the successful in-vitro fertilization of corals. 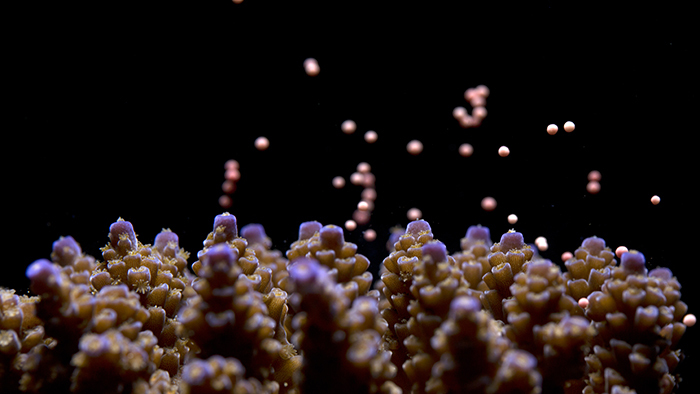 The team has focused on Acropora millepora and Acropora tenuis frags collected from the Great Barrier Reef. Close monitoring allowed the team to determine when the corals were gravid and when release of gametes was due and specimens were isolated at the time of gamete release to allow the team to make specific crosses between individual corals. Egg bundles being released. Photo by Jamie Craggs. At present, the resulting coral larvae are the size of a little finger nail and not exactly overwhelming to look at, but the achievement should not be overlooked. Creating protocols that will allow researchers to determine when corals reproduce and with which specimens, opens up a world of opportunities. Just think of the potential new ‘morphs’ that could arise which might better tolerate warmer oceans or support sustainable mariculture projects with commercial attractive varieties. It’s hard not to sound too excited; after all, corals in the wild are still facing unprecedented threats and the Horniman cannot achieve much without these techniques and protocols being replicated and put into practice across the world – especially in source countries where mariculture operations already exist. A. tenuis and A. millepora from last year’s captive GBR spawning are growing well. Photo by Jamie Craggs.